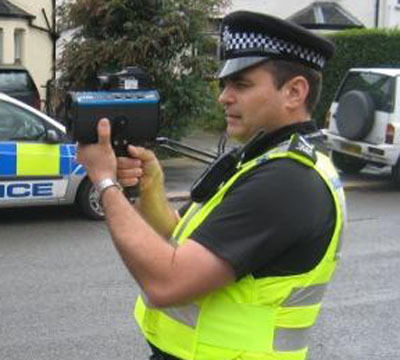 Police Sergeant Mark Kathro conducting speed checks in the East of Cambridge. Speeding is one of the top issues raised at local police priority setting meetings in Cambridgeshire. The most important reason to tackle speeding is to improve the safety of our roads, reduce injuries, and to make sure cyclists and pedestrians in particular feel safe. While excessive speed alone can be a problem I want to see enforcement against other road safety related offences too, including dangerous and careless driving, unsafe vehicles and HGV drivers not complying with the rules. Enforcement by the police cannot be the prime means by which safe roads with the vast majority obeying the law can be obtained. Where people are asking for speeds to be reduced this has to be done by changing the road environment and not simply posting new speed limits and expecting the police to enforce them. Education relating to road safety, as appropriate for school children of all ages, particularly those reaching driving age is very important; and it is something the police and others’ with credible relevant experience of the consequence of illegal and dangerous driving need to get directly involved with. A Police and Crime Commissioner needs to ensure that road safety is properly considered during the design of new developments in Cambridgeshire and that our roads are suitably adapted to cope with changes to the way they are used.